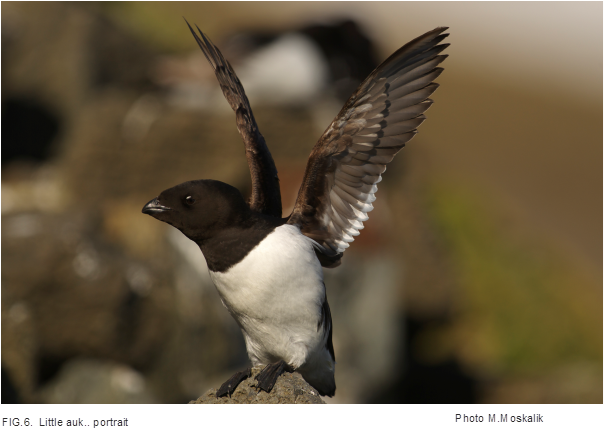 The little auk is an endemic marine bird species whose main habitat is the Arctic Basin, where it usually lives in large colonies. The animal is one of the most abundant species of seabirds in the world; populations are estimated to be over 37 million breeding pairs. The little auk nests in coastal areas of islands in the Arctic Ocean and sub-Arctic seas, with large populations living in the North Atlantic. It eats mainly marine zooplankton, and can dive to a depth of 30-50 metres. Arctic foxes and birds of prey such as the glaucous gull are the little auk’s natural predators. coloration: no marked sexual dimorphism, the colors of the plumage is black and white.